These Cagllari Daytona pocket bikes are the best bang for your buck. Outperforming much more expensive pocket rockets, the Cagllari Daytona bikes feature durable alloy construction and a torquey high output 2-stroke gas motor. Its lightweight, no-frills design and construction makes the Cagllari a favorite among club racers and enthusiasts alike. The open body structure allows the pocket rocket rider to access critical components and adjustments on the spot with minimal tooling. Super agility is this pocket bike's forte. Having the highest ground clearance of any mini bike allows the rider to lean at extreme angles to get the most speed going through tight turns. With a little experience, racers of all ages and heights can even knee-drag the inside knee on every turn, just like the GP Moto Pros! Everything is adjustable to custom fit each rider including tire pressure, a top speed regulator, throttle and brake responsiveness, handlebar height and angle, along with foot placement. This pocket bike comes fully assembled and includes everything you need to start riding immediately. There are stickers for you to customize the look of your pocket rocket as well. 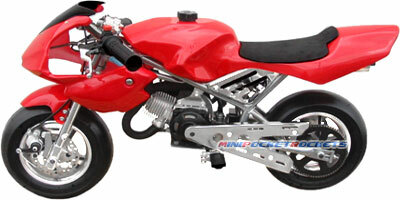 These pocket bikes are the original Daytona models with the highest quality construction. Look at our pictures below and compare them to the imitations and you will see that our pocket bikes are built to last longer and go faster! EPA APPROVED & CERTIFIED - OUR POCKET ROCKETS ARE THE ONLY ONES LEGAL IN ALL 50 STATES! Included Free with Pocket Rocket: Bike Kick Stand, 1L Gas Mixture Bottle & Cap, Tools (sockets, screwdrivers, wrenches), Tool Case, Owner's Manual and our free extended warranty.